What do you do with some old gear you forgot you had? Restore and upgrade it, of course. Neither the SA-500 or TX-500 had been used in a very long time and after powering up I could hear they were in need of work. Checking a few caps I found them way out of tolerance, so I replaced all the caps in both using a selection of Elna Silmic and Cerafine. One of the emitter resistors in the SA-500 was cracking, so all 4 were replaced. Some of the semi-conductors needed replacing in both as well. Of course, most of the pots were dirty, so they all got a good cleaning. Things were sounding better now. Intrigued, I decided to make a few upgrades, which I'll just list. * Replaced the very odd stock binding posts with new 5 ways using black FR4 as a mounting plate. * Replaced the stock power cords with shielded 16 gauge as there was no room to mount an IEC on either piece. * Applied Dynamat Extreme to the top and bottom covers. * Removed the SA-500 speaker On/Off switch from the circuit, making a direct connection from the amp board to the outputs with upgraded wire. * Upgraded the wire between the pre amp board and the amp board. * Removed the connections to the switched/unswitched outlets. * Replaced all the RCA jacks with gold plated copper versions and spaced them further apart to allow the use of modern day interconnects. Again, I used black FR4 as the mounting plates. * Replaced the SA-500 power light with a diffused blue LED. * Replaced the TX-500 dial lights with diffused white LED's and the FM Stereo light with a diffused blue LED. Since the tuning meter is an off white plastic, clear blue LED's were used to back light it resulting in a diffused appearance, which matches well with the other blue diffused LED's. I'm still toying with the idea of replacing the volume control with a motorized version allowing remote control, but since these have ended up in a guest bedroom, we'll see about that. Thanks to Don (will make just about any LED you want, contact at deh12110@yahoo.com) for his help with the LED's and to a guy named Mark on another forum for his help with the semi-conductors. Those were two areas I had limited knowledge of, but have learned a lot more about both since I started this project. Pic 1 - the original RCA's and power cord, I already upgraded the binding posts. Pic 2 - view of the upgraded RCA's and power cords. Pic 3 - close up of the new RCA's and mounting board. Pic 4 - the original lights. Pic 5 - with the new lights....ah, much better. They look real nice Jesse. I like that silver face classic "clean" look. Very nice work. How do they sound now? Great job on those new RCA's on the back. It takes some thought and planning a lot of times to get the different sizes on board and looking right. Cool to get the peak at what you were working on! Very nice Jesse!! Great job bringing some classic gear back to life. Thanks guys, I had fun. 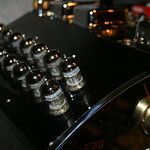 Like I said above, nice....kind of a tube amp sound. Will they ever replace my other gear? No, never. Jesse what is black FR4....Im curious to know. Unclad fiberglass board, the same thing printed circuit boards are made from.